Today seems like a good day to go ahead and finish up handicapping the rest of the Congressional races. We will start with what I expect to be the most competitive race in both June and November. Sadly, no viable Orange County candidate is running for this seat, and for whatever reason political people in Orange County don’t seem to care much about this race. It is important to note when looking at the map below that even though Laura Richardson lives in this district she has opted to run in a different seat. This seat will be an absolute dog fight. I expect resources from Washington D.C. on both sides to be poured in, after the primary is over. With Laura Richardson opting to run for a different seat it leaves this one wide open. Democrats have around a 10 point registration advantage. However, Long Beach which is the largest part of this district has lower turnout than Orange County. Add in a conservative leaning DTS crowd (20.5% registration) and you get a fun race to watch. Republican Steve Cooley did get more votes than Kamala Harris in this race and Proposition 8 did pass. The Democrats have had an advantage here though in both 200 and 2010. The primary is already a circus with 4 Democrats and 4 Republicans all vying to make it into the top 2. Based on registration it is fairly obvious that one candidate from each party will emerge. State Senator Alan Lowenthal who will have the ability to run a strong campaign having gained experience running for legislature. He is running as a Democrat. Peter Mathews a College Professor/Educator who is running as a Democrat. Then comes the curious case of Dr. Jay Shah and Usha Shah who are both running for this seat. Normally it is not shocking to see people with the same last name running for an office, but these two actually live in the same house. If anybody has an explanation on this, I would love to hear what it is. Long Beach City Councilman Gary DeLong is running, but he chose not to use his elected title as his ballot designation. He is listed as a Republican. Former Congressman Steve Kuykendall is looking to make a return to D.C. having thrown his hat into the ring. Steve Foley is the only Orange County candidate running for this seat, but he also made a huge mistake by putting no ballot designation down. Sanford Kahn is the last Republican running for this seat and he is listed as a Small Business Owner on the ballot (similar to what DeLong used as a designation). The factors at play- Alan Lowenthal is the most viable Democrat through high Name ID, more campaign experience, and best ballot designation. The Shah’s will split the vote and Mathews although a very brought guy will likely not be able to jump ahead of Lowenthal. Of the 4 Republicans running, Foley is automatically in the category of having no shot because he did not put down a ballot designation and Kahn does not have enough Name ID to get into the top-tier. This second slot will clearly come down to DeLong and Kuykendall. Kuykendall was in Congress, has name ID, and clearly knows how to run a race. DeLong is currently on the Long Beach City Council but he made the mistake of not putting his elected title on the ballot. In the end I think that Kuykendall has simply been out of the game for 10 years and his name ID will be trumped by DeLong who is currently on the Long Beach City Council. 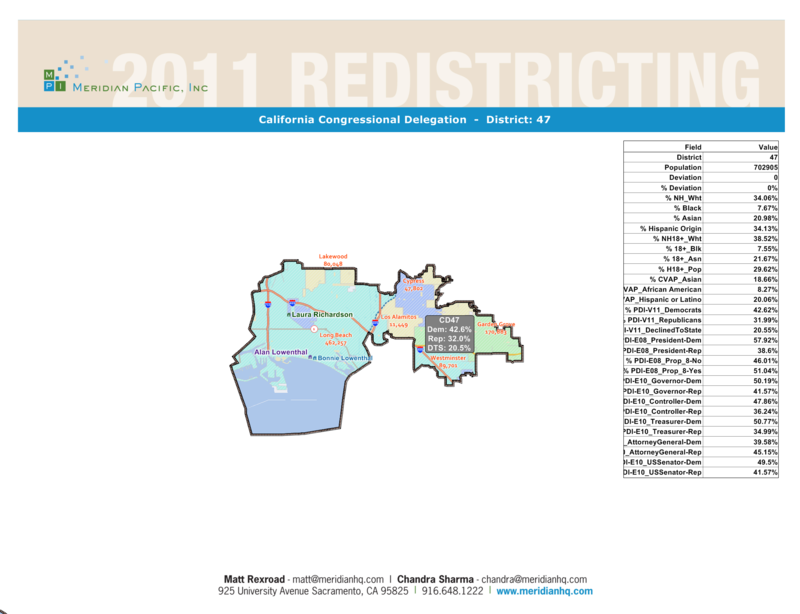 This entry was posted on April 12, 2012 at 9:38 AM	and is filed under 47th Congressional District. Tagged: Alan Lowenthal, Gary DeLong, Jay Shah, Peter Mathews, Sanford Kahn, Steve Foley, Steve Kuykendall, Usha Shah. You can follow any responses to this entry through the RSS 2.0 feed. You can leave a response, or trackback from your own site.